George Downing Construction (GDC) has broken ground on a major project to construct Leeds Beckett University’s £80m Creative Arts building – a new hub for creative education in the city. The iconic building is being delivered by developer Downing and has been designed by architects Hawkins/Brown. The state-of-the-art facility will be home to the university’s School of Film, Music and Performing Arts, plus the fashion department. It will be packed with specialist facilities including a performance theatre and 220-seat Dolby Atmos movie cinema, as well as specialist studios for fashion, music, film and television. Ian Orton director of GDC, said: “This is an exciting scheme, which will form a new home for creative education at Leeds Beckett and we’re delighted to be starting on site. This landmark building will include a number of outstanding technical features and facilities, creating a world-class learning environment at the heart of the campus. As the flagship development in the new Innovation District in the city, the Creative Arts building will sit in the heart of Leeds’ Civic Quarter. It is sited on Portland Way, opposite the Rose Bowl – the university’s Business School. 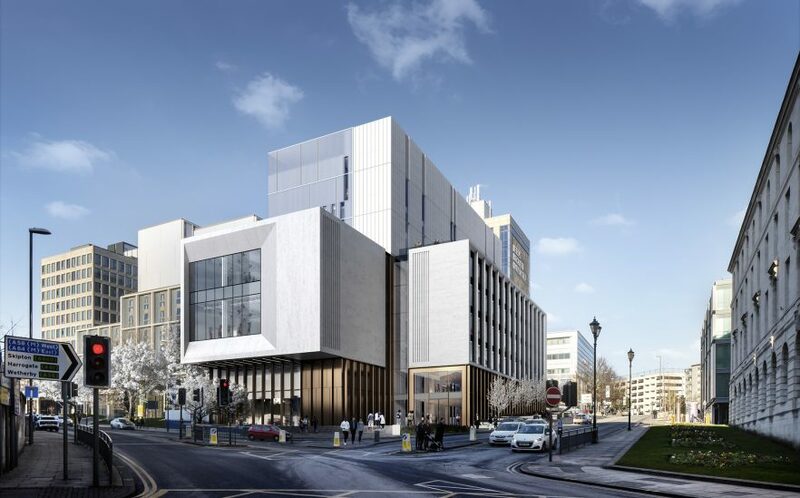 The Innovation District is a partnership between Leeds Beckett University, the University of Leeds, Leeds Teaching Hospitals NHS Trust and Leeds City Council. The partnership aims to attract new research facilities and drive economic development and regeneration. It will provide a range of quality work spaces, create new development opportunities and provide upmarket housing to attract and retain skilled workers in the city. The Creative Arts building is due for completion in September 2020. It is the first new development in a £200m programme of investment at Leeds Beckett over the next five years. It is also the final phase of Downing’s £100m transformation of the once vacant wider site into the distinctive City Village campus living environment. Downing and Leeds Beckett have enjoyed a successful partnership for over a decade. The Creative Arts building follows the flagship, multi-award-winning Broadcasting Place development featuring best-in-class student accommodation and teaching space that Downing delivered for Leeds Beckett in 2009. The iconic Broadcasting Tower building at the heart of the development beat competition from buildings including the Burj Khalifa to be named Best Tall Building in the World by CTBUH – a global panel of architects and the world’s leading authority on tall buildings.